The world leader in the sports industry brings decades of expertise to the game of golf through the Nike Golf Division. With a wide range of golf products, including award-winning golf clubs, Nike Golf incorporate cutting edge technology into each piece. 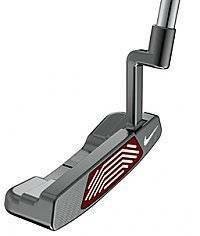 Nike Golf’s Method line of putters has been used by golf greats like Tiger Woods, Stewart Cink, and Lucas Glover. While the technology and design of Method putters makes them tour-worthy, the sticker price places them out of reach of many non-tour players. Thankfully, Nike released its Method Core Putters, a line that has the same technology as the Method putters with nearly similar performance, but with a lower price tag. The Nike Golf Method Core 3 Putter gives players the tool to experience faster, more controlled forward rolls. The Nike Golf Method Core 3 Putter features the most up-to-date putter technology designed by the golf-industry leader, Nike Golf. Nike Golf Method putters’ key feature is the unique polymer-groove technology that promotes a faster ball roll off the green. The Method Core Putters have the same polymer grooves, but via an insert instead of etched into the putter’s face. The polymetal insert reduces vibrations upon the putter’s impact with the ball; the putter creates a pure sound a feel upon impact. The Nike Golf Method Core putters provide less backspin than traditional putters, and less backspin equal less skidding and more control. The putters are available with a 33 inch, 34 inch, or 35 inch shaft length. All of Nike Golf’s Method Core putters feature a black nickel finish for reduced glare on the green. Amateurs have praised Nike Golf for putting championship-winning technology into a putter that the average player can afford. One reviewer labeled it “a must buy for anyone looking to lower their scores.” Overall, reviews and testers confirmed Nike Golf’s claims that the Nike Golf Method Core 3 Putter achieves smooth, straight rolls with a soft feel. The putters are easy to line up and should improve the scores of many amateurs.